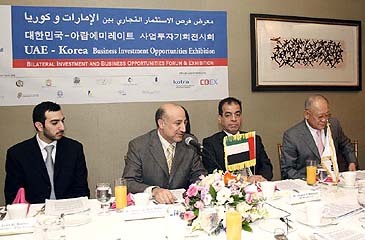 A press conference introducing forthcoming UAE-Korea Investment Exhibition at COEX gets underway in Seoul on Feb. 15, 2007 in the presence of Minister Ibrahim Al Mansouri of UAE Embassy in Seoul (second from right) and President Abdul Salam Al Madani of Index Holding of Dubai (second from left) and Chung Chai-Kwan (far right), president of COEX. At far left is Mr. Eng. Anas Al Madani, vice president of Index Holding. A press conference aimed at explaining the objectives of holding the 2007 UAE-Korea Business Investment Opportunities Exhibition in Seoul was held here on Feb. 15, 2007 in the presence of major Korean media representatives. The exhibition jointly organized by COEX of Korea and Index Holding, a Dubai-based exhibition and convention organizing company, is scheduled to be held at COEX in downtown Seoul from 7-9 June 2007. Shaikha Lubna Al Qassimi, UAE Minister of Economy and other prominent figures from both the public and private sectors of the Middle East country will participate in the exhibition. In his opening remarks before the group of media representatives, Minister Ibrahim Al Mansouri at UAE Embassy in Seoul said that the June event will play a big role in promoting the economic and trade relations between Korea and UAE. "We, as embassy of the United Arab Emirates, strongly support this event and through it we affirm the importance of utilizing the great economic potentials available in the two countries for establishing joint projects," said Minister Ibrahim disclosing that UAE has recently enacted favorable laws and regulations as well as made many incentives to foreign investors, permitting foreign ownership and transfer of capital and profits, in addition to exempting foreign investors from income or corporate tax in recognition of the importance of attracting foreign direct investment (FDI). In the course of the press conference, one of news media representatives came out with the issue associated with Dubai's residential property market, which he maintained somewhat overly heated..
"I'm not in a position to make any serious comment on the issue but the feared slump in Dubai residential property market is unlikely to occur while office rents will continue to rise over the next two years." Abdul Salam Al Madani, president of Index Holding said pointing out that Dubai's population will hit 2.5 million by 2010, creating demand for an additional 480,000 residential units (based on 2.5 people per unit) quoting a recent report made by Dubai-based RichVille Advisory Group. "Dubai's office market is currently offering one of the highest returns worldwide, while prices are considerably below international average. The current return on offices exceeds 20 percent, and it is expected to increase over the coming two years." he quoted the advisory group as having said in answering a question raised by one journalist. Pointing out that the Dubai Strategic Plan - 2015 (DSP), unveiled Feb.3,2007 by Sheikh Mohammad bin Rashid Al Maktoum, UAE Prime Minister and Vice President, and Ruler of Dubai, is set to maintain double-digit economic growth, achieve a GDP of $108 billion and increase real per capita GDP to $44,000 by 2015, he explained that the plan, launched under the theme "Dubai Where The Future Begins" sets out a strategic approach that focuses on developing the emirate's most dynamic economic sectors that have been the key contributors to Dubai's annual real GDP growth rate of 13% since 2000. "We are very proud of being able to team up with INDEX Holding, thus becoming one of the active partners in the growth of the UAE, driven by the vision of H.H. Sheikh Khalifah Bin Zayed Al Nahyan, President of United Arab Emirates and H.H. Sheikh Mohammad Bin Rashid Al Maktoum, Vice President, Prime Minister and Ruler of Dubai, said Chung , President of COEX, which is looking ahead to become Asia's No. 1 Convention and Exhibition Centre making Seoul Asia's No. 1 convention and exhibition hub city by 2010. It was in November last year that COEX and Index Holding signed a memorandum of understanding in Dubai to share their common vision about how quality conferences and exhibitions should be organized and managed. Based upon this intention, the two business partners have designed a plan to reach successful outcome in the future and help each parties to promote and market their exhibitions and meetings internationally, and develop events awareness among the target audience of each event. As part of the second phase of joint projects, Index Holding and COEX have agreed to organize two important events- Oil and Gas and Real Estate Exhibitions-in Seoul in 2008. Likewise, an exhibition featuring a wide variety of Korean characters will be jointly organized by the two business partners in Dubai in October 2008, according to Mr. Abdul Salam Al Madani, president and CEO of Index Holdling. He said that the private sector is the main partner for the development of the UAE driven by the vision of HH Sheikh Mohammed Bin Rashid Al Maktoum, Vice President, Prime Minister and Ruler of Dubai. COEX and Index Holding will team up in making Dubai one of the leading cities in the world as active partners in the growth of the economies of Korea and UAE, he said. With the vast expansion and the fast formation of different cities, towns, villages and bays within Dubai, INDEX took the lead by moving to Dubai Health Care City in 2005 becoming one of the Founding Partners of this unique city. INDEX in 2005 launched Health Management a company specialized in consultation services, training and education for health care institutions and professionals aiming to be the major training and consultation organization specialized in health care management in Dubai. Today, INDEX is an active member of several international federations such as the World Dental Federation — FDI, International Hospital Federation — IHF and the International Association for Orthodontics — IAO. Moreover, INDEX is in close cooperation with the Academy of General Dentistry, American Dental Association, Greater New York, International Dental Manufacture — IDM, International Orthodontics Association, IDS Cologne, MEDICA, CHARITY, Messer Düsseldorf, American Academy for Continuous Education and Saudi Authorities for Medical Specialties. INDEX has close relationship with several United Nation agencies such as Humanitarian Affairs and Emergency Relief and World Health Organization, in addition to OPEC and other environmental agencies such as the Regional Clean Sea Organisation (RECSO). INDEX Holding was officially established in January, 2006 and launched to the public in March 1, 2006 for the purpose of managing its current companies and to venture into owning, controlling, managing and acquisitioning several other companies. In the meantime, COEX has made the site for international exchange through a number of international conventions and conventions and been positioned as the best convention & exhibition center in Korea through numerous cultural and art events since its inception in 1979, Chung Chai-kwan, President of COEX said. It has the facilities of 12 exhibition halls in the building of 4 stories and 4 basements in the site of 11,000 Pyong (36,300㎡) (total building area of 130,000 Pyong, 429,000㎡), convention hall to accommodate 7,000 persons, 61 conference rooms, and high-tech office and management systems. Furthermore, it has been expanding the spaces of culture and art with opening of super-scale cultural complex, COEX Mall in May, 2000, and COEX Art Hall in Aug., 2004, according to Chung. As seen by the floating populating of average 140,000 persons per weekday, COEX is located in the real core of Seoul. It has held big events successfully, including The 3rd ASEM in Oct., 2000, 100 Years of Nobel Peace Prize, Preview in Seoul, Exhibition of Government Procurement of Excellent Products, Seoul Int'l Book Fair, Trading Service Show, Seoul Int'l food Technology Exhibition & Seminar, Seoul Congress of Universal Postal Union, Congress of Int'l Advertising Association, Seoul Congress of Interpol, Congress of WTCA (World Trade Center Associations), World Congress of Food Science and Technology, OECD Workshop, World Conference on Transport Research, Seoul, etc. In addition its world-level facilities, COEX has experienced experts groups including professional exhibition organizers and professional convention organizers. As the top leader in exhibitions and conventions, COEX will solidify the foundation of this future-oriented industry and will develop and expand the cultural events industry. "Our business partnership with Index Holding will help enhance the status of Korea's exhibition and convention industry by and large." Chung said expressing his hope that COEX will become a convention and exhibition hub in this part of the world in the near future.